Namaste, I send much love and light to you, always. As the Pleiadians would say to you, ’A Komo Ha Halima,’ which is their great love greeting for you. Do you want to know the great secret within this star message? 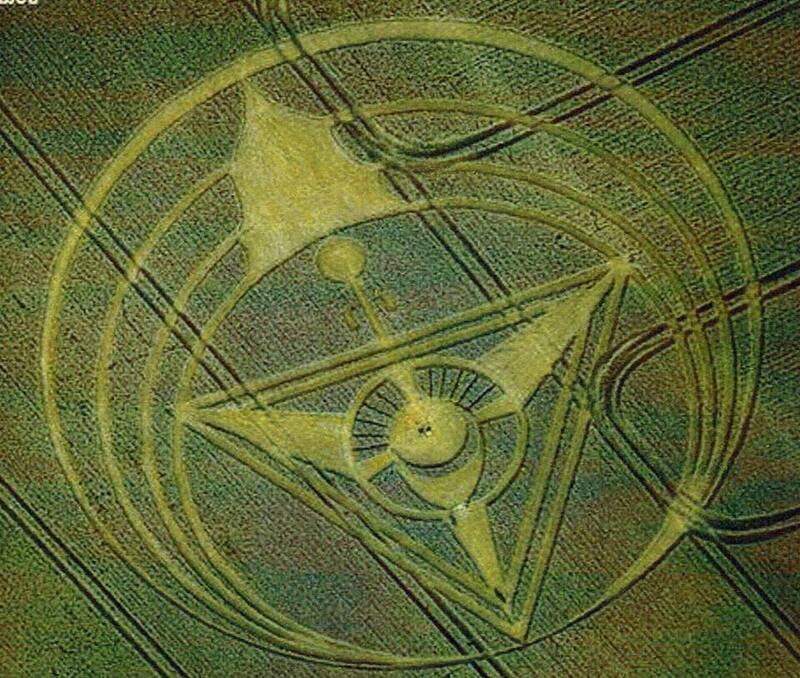 All star messages have secrets within them and what we see in the crop circle image is only so small of what it really means. Each dimension we awaken to reveals greater secrets, which is very much like this message here. Are you ready to delve deeper into your spiritual being? This is the journey of the person who desires to awaken greater to their greater self. They are ready for the next stage of ascension and to be in the greater spaces of love guidance, understanding their greater purpose and manifesting with Divine Love. Provisions have been created for the ones who are ready to go to the higher states of love and ascension, and at this time the calling from the Divine and the Galactic Federation of Light Society is very great and increasing. Here it shows a person during the greatest Divine Pineal Gland Activations possible upon our plane, which only CAEAYARON, can give to us. CAEAYARON (KRYON) is the Great Divine Awakener and also is here to balance our flows of love and build us up to be able to hold the greater transmissions coming through in the future to bring mankind into states of love. CAEAYARON is building us up and he can only do this if we are willing to connect into our greater codes as these codes hold our greater connections to the greatest gifts of spiritual love. It is only when we connect upwards with CAEAYARON we can grow into strong energetic people, and it is only then we can hold those flows of love coming, collectively. They will be mighty powerful. At this stage we are not strong enough collectively to do the work of the Divine. There is no other way to build people up into collective love strength consciousness together. We, who have been awaiting this time, have always had a knowing the Great Divine would call and we are so happy that this is the time when we can truly grow into the higher love consciousness, which was always promised to us. Here in the star message, you see what happens when a beautiful person at the Divine Pineal Gland Activations receives the greater awakening codes of love. These are the same codes we lost when we collectively fell during the greatest fall of Lemuria. In Lemuria, CAEAYARON worked with three light grid programmers to bring the love flows to the people. Here in this time, he is connecting us back to those same Lemurian codes with his Light Grid Programmer (Suzanna Maria Emmanuel). Please listen to the teachings of CAEAYARON on You Tube (under Suzanna Maria Emmanuel) to gain greater understanding of the ‘gateway’ created by Divine. Two small symbols around the gateway, symbolizes equalizing, releasing, balancing of human karma that happens during the Divine Pineal Gland Activations with CAEAYARON. He is the Great Balancer and also the Great Divine Judge and because of the great balancing healings, the individual who receives these activations from CAEAYARON, no longer carries the karma any longer. It is released, it is equalized by the greater violet flame and this person no longer needs to come back to the human realm, should he or she not wish to. This individual is free to go to the higher star dimensions after passing. This is the first time people are permitted by the Great Federation of Light Society to return to the greater spaces since the great fall of Lemuria. Since the time of the greatest fall of consciousness, none of the Lemurians who fell were permitted to go back, hence we kept coming back again and again to our earth plane, waiting for the time of our karmic release to return to the greater love spaces. The circle above the gateway represents our personal ascension codes. These codes were gifted to us in Lemuria and they held all the keys to help us ascend to the greatness. If we had not fallen in the times of Lemuria, we would have been able to lift up the earth dimensions and no more darkness would have existed in any of the dimensions as all would have returned to the love and the light. However, because the collective decided against the light, these codes were disconnected from us and the gateway was let go. Again it shows how powerful these connections are and how important it is to become activated. Once we become activated, we are able, with CAEAYARON as he allows it, to reach into the heart of the Crystalline Grid, the Divine Love Element Archangel, and receive the greater flows of strength. (shown by the large light shape in the grids). These great love flows stream into us during the activations, anchoring us deeper into the Crystalline Grid and into the earth grids and magnetic grids. During the Divine Pineal Gland Activations, you will learn so much more how this works. The anchoring within the light grids and the earth spaces happen because we become a stronger grid structure as is shown here by the triangles, strong and powerful they are. We cannot fall over any longer on a spiritual level as we are being held in Divine Love. Our vibrational spaces become stronger, especially after the third and fourth activation, and our whole being becomes stronger. Here it also shows two lines within the triangle showing the building of the light of the people to hold more and more light and love flows to bring mankind into states of love. The ones who are activated understand deeper purpose and are connected with greater Divine Flows of Love, and they desire love consciousness and desire Divine Will to take place to bring us into deeper healing and love, especially for those who are activated to the ‘Star Sacred World Healer’ states. Here, beautifully illustrated, also shows the power we will gain collectively. In the great light space it shows the levels we grow into collectively. The more people connect to their greater codes, which are held within the Crystalline Grid, the greater the gifts come flowing into us, and the greater we can become part of the Greater Universal Consciousness, which is shown by the point at the top of the highest grid. At the highest level, we are taken into the Great Family of Light and then we all ascend together. Ascension is not only about our personal selves, or about human love consciousness for that matter. This is about Galactic Ascension as one Universal Body. Isn’t it just something, how all through these years we have been trying to understand spirituality, trying to gather ideas, trying to understand our personal ascension? Now the gates are opened to the higher knowledge as Divine is here to take us upwards. Everything is FAR GREATER THAN WHAT WE EVER DREAMT POSSIBLE! Now is the time when the greatest choices are able to be made by us. Do we want to climb up higher into the greater love consciousness together? Do we desire to be part of the Universal Ascension process? WOW!!!!!!! Personally, I am so glad this time has arrived, and I know I am not the only one. All who have received the Divine Pineal Gland Activations from CAEAYARON are in the healing grid, and for us, for us who desire the healings and are working with the flows and the exercises given by CAEAYARON, WE ARE SO, SO GRATEFUL. We are also deeply at peace because that is what CAEAYARON gives to us, a deep peace and calmness, allowing us to grow with ease, with love, with gentleness. Triangles – shows strengthening consciousness, anchoring into the grid spaces with strength. The pineal gland, symbolized by the eye, becomes greater and stronger during these connections. The triangles are firmly anchored into the greater spaces and also into the earth spaces to allow greater love to be brought through to the consciousness of mankind. Great healing takes place for the person who connects to the greater codes. The line upwards – shows the gateway. CAEAYARON has given that gateway. This gateway connects to our greater codes, held in the Crystalline Grid, during the Divine Pineal Gland Activations. The circle – symbolizes the codes as he connects us up to the higher codes and then connects them deeply within the love of the Divine Love Element, Sacred Heart of the Crystalline Grid, bringing greater flows and healing within the people who receive the Divine Pineal Gland Activations, connecting into the greater love firmly and beautifully. The two symbols on the sides of the gateway – showing karmic balancing and equalizing. CAEAYARON is the only Divine Being who can release us from our human karma as he is the Divine Aligner. During the Divine Pineal Gland Activations, he releases us from our human karma so that we are able to grow into our ‘unlimited selves,’ and reach into the greater dimensions, never having to suffer any more. The Great Light - Shows the Great Sacred Heart of the Divine Love Element Archangel. All who are activated into this great light are connected in greater. When more people connect in, the greater levels of understanding and higher spiritual gifts can be achieved. The higher we connect in collectively as activated people, the more love we are able to hold, bringing healing to our own lives, and healing for mankind also.